Easily the most versatile, practical and attractive piece of pet furniture yet! 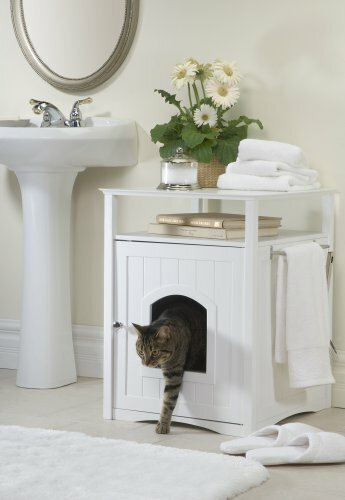 Use the Pet House as a litter box cover in the bathroom, or as a cozy nook for your pet's bed in the bedroom or living room. Equally suitable for cats or small dogs, the Pet House is an attractive, functional cover for a litter box or a home for your pet's well-loved (but messy!) bed. The door is magnetized to keep it securely closed during regular use, and swings open wide for easy cleaning. It doubles as useful furniture for you, too use as a console in the bathroom, a side table in the living room or a bedside table in the bedroom. Added shelf gives you extra storage space, and you can attach the included stainless-steel towel bar to either side of the cabinet.However you use it, the Pet House will help you confine pet-related mess and will look great doing it. The classic design with wainscot paneling and stainless-steel door knob looks great in a variety of decors. Easy to assemble, and fits a standard/large litter box (not included). External dimensions: 18" w x 20" l x 25" h. Internal dimensions: 16 1/2" w x 18 1/2" d x 18 1/2" h. Conceal a litter box or pet bed in plain view, inside this handsome Pet House. Order yours from Brookstone today! I wish I could give this thing no stars. After looking for a solution to a litter box out in the open and constantly cleaning up litter from the floor where the cats kicked it out, this is the ultimate looking and most functional thing I could find. I wish it was bigger to hold a larger litter pan but I have a 20 pound cat who uses it just fine. Fantastic solution to hiding the kitty box! Hides the unsightly litter box, and keeps the litter in the box for easy cleaning. My fussy Persian loves it. Wish I had seen it sooner. I'm sorry to say I didn't like it because I keep finding cat pee underneath the litter pan which means I have to keep washing the inside of the cat washroom. I'm not sure if it was my cat but I went back to the Boodadome because it's easy and contains the cat waste. This is a great product. Everyone wants to know where I got it...I have not experienced any of the problems that others have written about. The litter box fits perfectly and offers my very finicky cat the privacy she demands. I am very satisfied. I saw this in the Sky Mall catalogue while flying on business. Dust and stray litter is a huge problem with three cats. So I bought three of them (before Christmas, Amazon sold them a bit cheaper and with free shipping). I chose them over other options because these had solid walls and would fit better in a colonial style house (i.e. looks like furniture, not like cat box covers). Dust is now more manageable and the houses do a great job of making the litter boxes more appealing. Even my jumbo sized cat uses it. I purchased this product because I really liked the idea of hiding the cat box. I was very disappointed when I received it, I was unable to put it together, because the manufacture cut the pieces wrong. Very frustrating. I ended up going to a local store and purchasing one that was already together. While trying to put it together, I was very disappointed to see that the wood is very flimsy. Looks great, but it's not. This piece of furniture hides the open sight of the cat box in my laundry room and looks very nice as well. Great idea and very sturdy; think my cat enjoys the privacy!! I recommend this highly. Great price also, I've looked around. Very disappointing after readking other reviews. I'll make this to the point. 4) Most alarming!...There is a strong unpleasant fume that is generated by this product. Either the paint or stain lacquering is generating a fume that I feel is unsafe to be inhaled by anyone in the house. I do not want my pet breathing in these fumes. I'm sure anyone concerned about their pet would not either.